Provide practical assistance to allow the deceased to remain at home prior to the funeral, should this be the request of the family. Arrange all necessary paperwork to allow burial or cremation to take place. Provide facilities for viewing of the deceased prior to the funeral, according to the requests of the family. Provide the necessary vehicles and staff to conduct the funeral with dignity and professionalism, according to the instructions of the family. 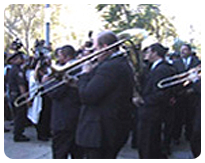 Arrange for special musical requests at the funeral service. Liaise with the officiant during the funeral service. Accept donations in lieu of flowers on behalf of the client, providing the family with a list of those who have donated. Provide advice and assistance with the registration of the death. Please note that the Funeral Director cannot register a death - this must be done by a family member or person closely connected with the deceased.